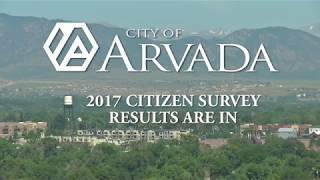 Arvada, CO – The 2017 Arvada Citizen Survey was conducted by Northwest Research Group (NWRG) between September 27 and October 29, 2017. Unlike past surveys which were sent out in the mail, NWRG utilized a mixed-mode address-based methodology resulting in a total of 692 interviews—434 completed online, 87 completed by landline, and 171 completed by cell phone. Survey results were weighted for various demographic factors such as age and gender to ensure they represent proportions reflective of the entire community. View the full 142 -page report. 82% of residents say Arvada’s Overall Quality of Life exceeds or greatly exceeds expectations. 69% of residents say Overall Quality of City Services exceeds or greatly exceeds expectations. 79% of residents say that, Compared to Other Cities, Arvada is better or significantly better. 55% of residents somewhat or strongly believe Arvada is Headed in the Right Direction. 55% of residents somewhat or strongly believe they receive Value for Tax Dollars Paid. NWRG utilizes the above five questions to create a 5-Star Rating System, designed to measure the overall quality of governance and vision as a complement to traditional and individual measures of the quality of life and delivery of services in a city. The 5-Star Rating is intentionally designed to make achieving a 5-Star rating extremely difficult and no city surveyed by NWRG has achieved a 5-Star Rating. Very few have achieved a 4.5-Star Rating. The City of Arvada received a 4-Star Rating in the 2017 Community Survey.